A couple of months ago I put a post up on the Ultrarunning Community on Facebook after being fed up with dogs going for me on my runs. The gist of it was trying to push for areas of footpaths and national trails where it is compulsory to have dogs on leads. The responses were bitterly divided and it was probably one of the most commented on and aggressively debated threads I have seen on that page. There were two clear camps- those who owned dogs and were furious at the thought their dog should be on a lead on a footpath and those runners who had had problems with dogs whilst running. Before I get into this, I am don’t dislike dogs. I have never cried like I did when I was a nine year old boy and our dog was put down. We often talk about getting a dog now I have a family of my own, but it is too big a commitment and restriction at this moment in time. But the point is, I like dogs. The reason I wanted to write about this now is after what happened this weekend. As the nights draw in and Autumn deepens, my weekend runs are now during more ‘normal’ hours to make the most of daylight. During the summer months I often ran very early or late and the trails I used were typically deserted. Now I find I am out when others are out and this means more and more encounters with dogs. This weekend I did two twelve mile loops of a link up run I found in the summer. It incorporates Mountain Wood behind my village, The Palladian Way down to the historic Limpley Stoke viaduct and finally the Bath Skyline path around Bath and back to my village of Bathford. It is a great run and one I enjoyed a lot over the summer and was looking forward to running again. The problem is, this route never strays far from populations and there were a lot of dogs out off their leads. On Saturday, not one mile into this run I spotted two young Border Collie’s with no owner in site. As soon as I saw them, I followed the standard advice of slowing to a walk, continuing towards them and not making eye contact. Running, understandably, can trigger a dogs instinct to fight as can eye contact and sudden movement or retreating. They both spotted me and as soon as one belted towards me the other followed. I stood my ground as I always do and as they got closer I shouted at them to back off. They both slowed and came up to me inquisitively. One simply danced around me, but the other nipped me in the thigh. I won’t go so far as to call this a bite, but was more a warning/ test. There wasn’t much I could do, but continue walking with my hands high and keep an eye on both of them as they walked in circles around me. By this time the owners had come in to view, a pleasant normal couple, who having seen the dogs asked, “Did one of them just go for you?” I replied yes, but that it wasn’t aggressive yet was intimidating. He severely reprimanded the dog and they moved on. If someone pulled a knife on you outside a pub on a Friday night and then smiled and said “Only winding you up, Pal”, you wouldn’t see the funny side. I can’t think of many other hobbies where there is an innate threat from dogs, aside from maybe walking. However I have never had an issue when just walking. Whether it is the sweat or heavier breathing that triggers something, I don’t know, but I seem to be a magnet for dogs on runs and I know I am not the only one. During the Facebook debate one dog owner got pretty aggressive and said I should simply go and buy a dog of my own. Why? That hasn’t worked so well in America with guns, has it? On Saturday, I continued my run and finished without incident but wary that around every turn could be the dog that changes things. On Sunday I headed out on the same loop and a little further along I had the worst encounter yet with a dog. I was crossing a stile towards a football pitch and a road crossing when I saw a young-ish teenager out with a Labrador and a small dog. For some reason, the small one was on a lead but the Lab wasn’t. I don’t know why, as Labs are pretty lovely dogs usually, but I was quite wary. There was no sign to be, but I felt the need to give them a wide berth. I let them get around halfway across the football pitch before I climbed the stile and started to slowly make my way across at a walk. My theory was they would reach the road before me where the boy would put the Lab on a lead as well and I could walk up to the road, cross and continue my run. As they neared the road I was about halfway across the pitch and this is when the Lab spotted me. It went utterly berserk. Whether it felt I was a threat as there was no one else around I don’t know, but it literally shredded grass as it sped towards me from 100 yards away, teeth bared and barking and growling. I had absolutely nowhere to go and was completely exposed. I now know what is meant by ‘fight or flight’. All I could do was shout as loud as I could for it to back off, stand my ground and lunge when the time came. I was hoping it would be like all the other times when at the last minute it would veer around and just bark, trying to intimidate me. Yet it felt different. Around five yards away it made a lunge to launch up at me. Being stood still, I was in a good position to dart to the left and see it sail past me. I must have been screaming my head off at this point, as the boy ran over in tears shouting at the dog to back down. The dog pivoted and made a move for me again, where I swung my water bottle at it and it backed away. By this time, the boy arrived and dived on the dog. In credit to him, he was so distraught and did all he could to control the dog. I imagine last night he was more upset than me. I ran for the gate, vaulted it and was safely on the pavement. Had it been an adult there, I genuinely think it could have turned nasty. I was shaking, buzzing with adrenaline and anger, but what was the point in shouting at the boy? The thing is, I am a grown man, but what if the other person in the field had been a child. By all definitions this dog was dangerously out of control. It should not be allowed in a public place off the lead. There is a lot of press about dangerous breeds, but Politicians are scared to anger dog owners and so normal dogs that have aggressive tendencies have no monitoring whatsoever. I know people will be reading this and thinking up ways to defend the dog. Honestly- I did nothing wrong, I followed every bit of advice but was scared shitless by an out of control dog. If I had turned and run away I have no doubt at all it would have jumped onto my back and taken me to the ground where god knows what might have happened. Trail running is the third fast growing individual participation sport in the UK, after cycling and triathlons. I don’t want to have to just run on the road. I want to get out in nature and enjoy the beautiful countryside the UK has to offer. But at some point, something is going to happen to me, a dog or its owner. It is just a matter of time. And I know a huge amount of runners who have been bitten. I genuinely feel, like with certain livestock, there should be only certain places that are well marked that a dog can run off the lead. These should be fenced. I am not saying dogs should not be allowed on footpaths, they should be allowed anywhere but only on a lead. Why should someone have the right to let run free something that can intimidate and upset other users of that area? I believe if you take the responsibility of owning a dog, you also bear the responsibility of having a garden big enough to exercise that dog away from other members of the public or you must use designated, fenced areas where dogs can run free. The alternative would be to have an equivalent to a cycling proficiency test. Impossible to administer, I know, but someone should not be allowed in a public place with a dog off a lead if they can’t control it and prove they can control it. It is that simple. I know of some runners who now carry pepper spray with them or alarm systems that emit a high pitched noise that scares a dog. My fear with both of these is that they could send a dog even more wild, so I won’t be using any. But if anyone does have any suggestions or tips, I would love to hear from you. If you agree with me, share this and let’s try and do something. If you don’t, I’d welcome your responses too. I think it is something that needs debating. Dunno what it is about me or them but black labs seem to want to have a go at me but as you have observed, only when I’m running. I too am a dog owner (a grumpy beagle) and we never let him off lead as being a scent hound, a nose he’d follow over a cliff but also as he is scared of other dogs he tries to get past this by going for them first. Although usually once he realises they are no threat it’s all sniffs and waggy tails! I almost don’t mind the dogs coming for me as much as I get wound up by owners reaction that it is myself that has done something wrong. They really need to realise owning a dog is not the same as being responsible for your own pet. Dog owners must control their animals, so I disagree with runners having to carry personal protection devices, as it takes the emphasis off the dog owners. Having been attacked out running myself in the past, I take the view that if I’m attacked then its perfectly acceptable to act in self defence. Luckily, a good kick was enough to send it running off, but I would have no issues with escalating my response should the need arise. I am the owner of seven dogs… Five of them are working dogs and I’m not afraid of dogs. I am also a trail runner, sometimes with one of the dogs, but usually alone and I agree with all you have written…. 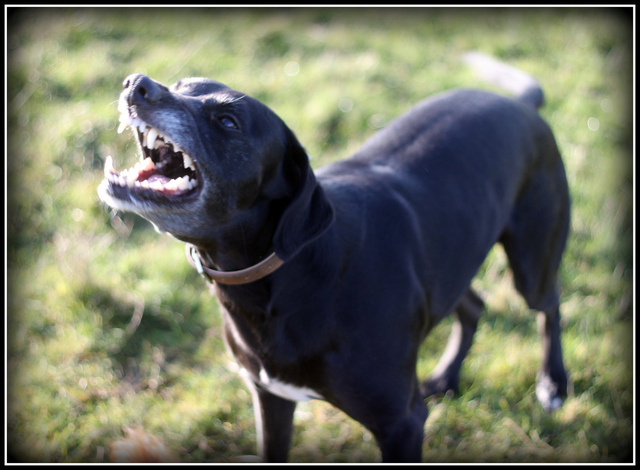 I have been intimidated on too many occasions, body checked by over enthusiastic Labradors and snapped at by herding collies… On one run I was ambushed by nine dogs (a mixture of greyhounds, lurchers, collies and terriers). The dogs were behaving like a hunting pack, the owner, a fairly ovate lady brining up the rear, could not control them. I dread to think what it would’ve been like for a person who was afraid of dogs. At worse; dogs are predators and someone running looks like fair game… At best they want to play, or present a tripping hazard. I put my dogs on leads if there’s a chance of meeting a runner or cyclist…. One reason being I don’t want anyone to trip over them, run into them, be forced to slow up or be frightened. Another reason is I don’t want any of my dogs injured by being accidentally trodden on, or cycled over. If people trained their dogs properly to begin with there wouldn’t be a problem. Our dog, at only 5 months old, sits and waits at the edge of the path/track for the runner/jogger to go by (on or off the lead, although while he is sitting and waiting, we do clip his lead on just to be safe) and wont move until told. Why does he do this? Because that’s what we taught him to do! Really annoys me when I see dog owners with absolutely no control over their dog, there is no need for it! Don’t get a dog if you can’t put the time and effort into training. Make sure that you introduce them to all situations you will come across on the daily walk and teach them the correct behaviour. If you don’t teach them you can’t expect them to know, they’re not psychic! Well i have read your report & must say i fully understand and agree with what you have said. I also agree with what Sarah has said. I too am an owner of the so called dangerous dog breed I have two lovely staffs, one is 8 years the other just 4 months old. I also am a trail & mountain runner. As sarah so well put it its the owners fault totaly if you teach your dog from very early age you will not have any problems simple as. my lovely solo has never ever gone for anyone and is as soft as tissue. she like my new boy staff has been taught to stop,sit,stay, & leave all very basic commands. I myself have had encounters whilst out on my local trails of owners with dogs going for myself, Twice this has happened recently and i have been quiet lucky, but have on both times let the owners know if i had been bitten. there would of been reprecussions. if you cant control your dog put it on a lead simple.As for personal protection i believe its a faulse dawn, most high pitched whisles would just make the dog even more angry.I think its a question of common decency really they want to walk their dog we want to run unfortunatly not a lot of people have respect for one another no more. I’ve often wondered about how I would defend myself if a dog went for me on a run and a kick seems like the obvious option but would this escalate the problem? Would the dog then up it’s attack if it felt in needed to defend itself? Or would they yield to a show of authority? I dont carry anything with me that could be used in defence and whilst I couldnt care less about the health risk to the dog if I doused it in pepper spray (my view is if its not under control then it deserves what it gets and I’d love to see the owner try and find me at fault for that), I just dont see that its my responsibilty to do so. I’m not usually scared of dogs but I’ve (so far) not had any really bad experiences, but the dogs I fear the most are the semi-feral farm dogs that are protective of their territory. And whilst this is understandable, if a public footpath runs through a property like this then the dog shouldn’t be out. I love dogs and would have one if my circumstances allowed so I find this topic very interesting, from both perspectives. But as everyone has said, the responisbility has to lie with the owner. At the end of the day a dog is an animal with instincts so we can never fully rely on them to behave in a certain way, so proper training is a must. I heartily agree with Sarah. I too have trained my dog to obey. It takes a fair bit of effort and lots of time which is why I expect more dog owners don’t do it. My 7 kilo, white fluffy Princess occasionally decides to pace a runner and when she does I discipline her and put her on the lead so she knows this is not acceptable. Most dogs are happy sniffers but I’ve had some nasty encounters whilst running and had to fight off several over the years. I’m a mild mannered guy but some primal wolf-response is triggered when I’m confronted by bared teeth, that low rumble and a rushing canine. If I was Usain Bolt I’d take to my heels but after running for hours it’s ‘fight’ rather than ‘flight’ I’m afraid. Perhaps the sweat I poured onto the karate Dojo in my teens was not nothing after all? Actually its more show that blows. In most cases worrisome dogs are cowards and, like Richie, I figure when confronted the best defense is attack so I don’t back down. Sometimes the owner is present, sometimes not. Either way I figure the dog is an extension of them. If the dog rushes or snaps, that is the owner threatening me and I let it be known that I’m not happy about it. “Love me – love my dog” works both ways. A couple of times I have loudly ‘snarled’ down aggressive dogs, they’ve turned tail and I’ve chased them quite some considerable distance (you might have teeth but I have Vibrams!). The irate owner has been left behind, but I figure the time they spend searching for their dog might make them think twice next time. And they may show other trail users more respect.